We here at the Barbara S. Ponce Library are big fans of the works of Nigerian-American author Nnedi Okorafor, especially her novel Who Fears Death, which, in 2011, made her the first black person to win the World Fantasy Award for Best Novel. Okorafor has proved herself to be a major player in the science fiction world, and no self-respecting scifi fan should miss the chance to pick up her work. Binti is a novella set in a universe where starships are living technology and multiple races interact on a galactic scale. When the titular Himba woman is offered a scholarship at the most prestigious intergalactic university, family strife about her selection and her decision to accept it cause her to abandon her family without warning. She finds herself on a living starship with many people from many cultures, and is intimidated by their strangeness until she finds commonality with fellow students in her field. She has barely started feeling at home when a terrifying event changes the course of her life, and she is thrust into a war of intolerance and revenge. Her academic gifts and understanding of the experience of strangeness, linked with her compassion, make her a key player in creating a new future. Okorafor uses her deep knowledge of African culture and religion to flesh out the interactions between individuals. Her descriptions of the Himba people and their practices reflected through her protagonist are used to show the many differences, and eventually, the many commonalities all peoples share. Binti’s thoughts are laid bare for the reader, and we struggle as she struggles, and fear when she fears. Her talent is a key part of the story, and she steps into her new life while respecting her past. Binti has won both the Hugo and the Nebula Award for short fiction. While Binti is a short novella, there are two more to be published in the series. Check the PPLC Catalog for Binti. Categories: Books, Dave's Picks, Diverse Books, Ebook, Plot, Quick reads, Religion/Spirituality, Science fiction, Short stories | Permalink. In summer of 2016, we asked our patrons for book reviews as part of our adult summer reading raffle. We have chosen the cream of the crop to feature here on our blog. This review is by Anne Wi. I was not sure what to expect when I first started this book, but I was quickly sucked in; I REALLY enjoyed it! The story is told from 13 (almost 14) year-old Marina, a teen stuck in a cult-like religious group because of her parents (who are separated). The Pastor of their “group” tells them that the end of the world coming soon, the date of which just so happens to be on Marina’s 14th birthday. The Believers, 144 of them because that is how many the Pastor said are needed, are ushered to the top of a mountain where they are told that they will survive Armageddon. Marina meets an unlikely friend named Jed, and they quickly form a tight friendship. I do not want to give too much away, but this is a must-read book, and a wonderful tale of friendship, love, and religious confusion. Do you think the world will end in this book? You will just have to read it for yourself. 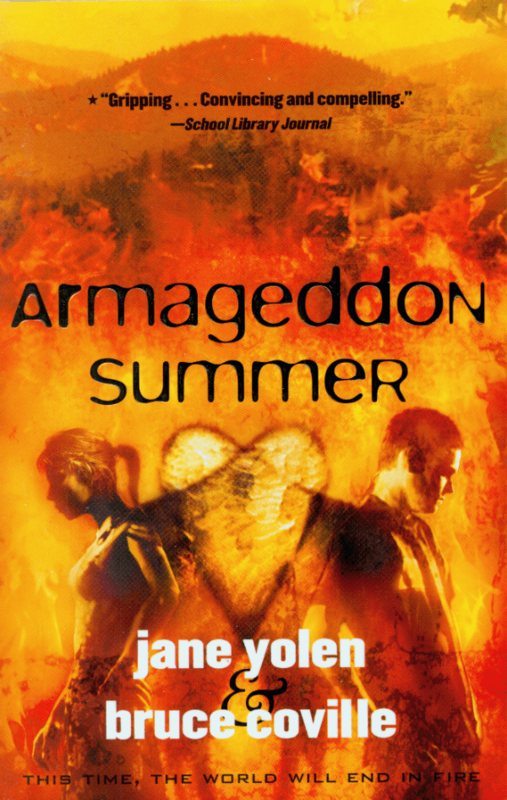 Check the PPLC Catalog for Armageddon Summer. Categories: Audiobook, Books, Coming of Age, Contemporary Fiction, Drama, Family Issues, Plot, Religion/Spirituality, Young Adult | Permalink. It’s Canada Day, and we’re celebrating with our neighbors to the north by recommending this distinctly Canadian masterpiece. Robertson Davies is one of Canada’s best writers, and any book of his you read will be amazing. Fifth Business is the about how a child’s carelessness leads to the ruin of multiple lives and begins a middle-aged obsession. It opens with the event—Dunstan Ramsay is a young boy in a Canadian town. His best friend and sparring partner in childhood, Percy Staunton, throws a snowball it him while quarreling. Dunstan ducks, and the snowball hits Mary Dempster, the pregnant wife of the local minister. The shock causes her to give birth to a premature child and unhinges her mind. The book follows Dunstan’s life from there. As a young boy, Dunstan experiences both fascination and pity for the wife, as well as guilt about the premature child and immerses himself in his study of the saints. Later, Dunstan fights in World War I and spends an extensive time as an invalid. He begins to believe that Mary may be a fool-saint. He returns home to find that Percy has prospered in the war, and the two become friends. The guilt Dunstan feels is exacerbated by Percy’s successes, and comes to a horrible climax where all the events from the past swirl around like angry ghosts. Robertson Davies is a writer of amazing depth and lyrical language. His layered storytelling invokes Jungian archetypes and synchronicity, in addition to religious and societal themes. This is not an easy read, but a very rewarding one. Check the PPLC Catalog for Fifth Business. Categories: Books, Canadian, Characters, Contemporary Fiction, Dave's Picks, Drama, First in a Series, Literary fiction, Philosophy, Plot, Religion/Spirituality, Setting | Permalink. In Edward Kelsey Moore’s debut novel, a trio of best friends share their first-hand accounts of growing up black in small town Indiana from the 1960s to the present. Equal parts humorous, heartwarming, and harrowing, this book puts you on an emotional roller coaster ride right alongside the protagonists as they deal with every twist and turn life has in store for them. Clarice, a talented pianist who gave up a professional career to become a wife and mother, struggles to suppress her growing resentment toward her cheating husband. Barbara Jean, beautiful but damaged, drowns painful memories in alcohol, but her drinking problem is becoming more and more noticeable. And Odette, as fearless as she is big around the middle, begins seeing the spirit of Mrs. Eleanor Roosevelt and knows this means her time is almost up. These three women lead very different lives, but their weekly meetings at Earl’s All-You-Can-Eat diner is the one thread that binds them all together. A scene in this book that takes place at an ill-fated wedding had me almost in tears with laughter. At that moment, I could so see this book as a movie. But until there’s a movie, you’ll have to read the book. If you enjoy slice-of-life stories, check this one out. Highly recommended. Check the PPLC Catalog for The Supremes at Earl’s All-You-Can-Eat. Categories: AnnMarie's Picks, Audiobook, Books, Characters, Drama, Ebook, Family Issues, Historical fiction, Humor, Religion/Spirituality, Romance, Setting | Permalink. Rhoda Janzen’s candid, hilarious memoir proves that you actually can always go home, even when home is to Mennonite parents. What problem can’t be cured with a little borscht? Rhoda is dealt two blows in a week’s time. First she is in a horrific car accident, and then her husband leaves her for a man he met on a gay dating website. With little else to do, Rhonda decides to go home to nurse her wounds and her broken heart. She finds comfort in the Four F’s: Family, Faith, Food and Flatulence. If you are expecting a book about self-pity, this isn’t it. Janzen’s humor and optimism shine through, even as she begins to reveal the horrors she endured before her road to recovery. After years away from her Mennonite upbringing, she sees the religion through adult eyes. It may be a world she no longer fits into after higher education (Mennonites frown upon that) and 15 years of marriage to an atheist, but she begins to recover fond memories from her childhood. The reader grows to love this quirky family just as much as she does. Don’t we all have family members who say inappropriate things at the dinner table or fart in public or cook cabbage 15 different ways? Well maybe not, but every family has their idiosyncrasies. Janzen is sarcastic and unapologetic. She’s one woman finding her own path after tragedy strikes. And I laughed the whole way there. Check the PPLC Catalog for Mennonite in a Little Black Dress. Categories: Audiobook, Books, Cathy's Picks, Characters, Clever dialogue, Family Issues, Humor, Memoir, Religion/Spirituality | Permalink.